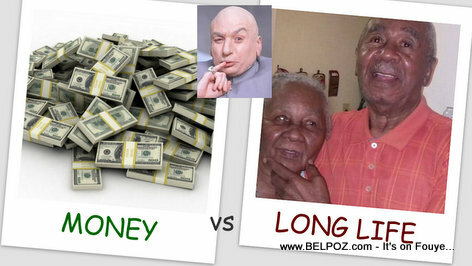 CHOOSE ONE : 1 Million Dollars vs a Long Healthy Life, which would you rather have? Let me ask you a question: If you had to choose between having LOTS of money and living a LONG healthy life, which would you choose??? I once told my father if I had to choose between having LOTS of money OR living as long as he has been living and in good health, I would choose long life. I grew up in Haiti close to the country side. I have seen people who have nothing, by that I mean NO material things: no refrigerators, no air conditioning, no tv, no cable, no internet, no smartphone, none of the things that you who live in a modern city would feel so "poor" without. Yet and still, these "poor" people ate organic food everyday. These "poor" people, perhaps because they don't have money, do not consume all the delicious processed foods that make all of us "fortunate" people so sick everyday. These "poor" people do not have the level of stress we deal with everyday. their life is rather simple. That's where my father is from. Is that why is is in such good health at his age? The man has never been sick his entire life. Nothing more than a headache, maybe a cold or a fever once in a blue moon. He is in his 80's. I asked my sister: Do you think we will live as long as our father? Which would you choose if you only had one choice: Money or a Long Healthy Life? m pa bezwen milyon dola. sa pa empotan. Sante ou pi empotan anpil.